So many books, so little time. 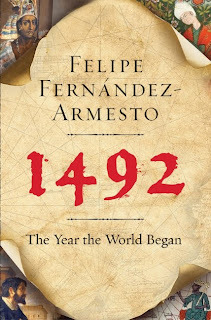 On the weekend I read a review of a book called 1492: The Year Our World Began which opens our vision beyond "in fourteen hundred and ninety two, Columbus sailed the ocean blue." I had not realized that there were doomsayers predicting an apocalypse in the year Christopher Columbus sailed away in search of China and instead "discovered" North America. Nor was I aware that this was the year when the Muslims who had ruled portions of Spain for nearly 800 years finally left for North Africa. From that time on Europe was associated with Christianity. In 1492 there was also a dispersal of the Jewish residents of Spain, the product of the Inquisition which began fourteen years before. I was aware that Christians, Jews, and Muslims had peacefully co-existed in Spain for centuries. We have to wonder how our world would be different if that remarkable model for religious tolerance and respect had continued. While at the Epiphany Explorations event one session involved a conversation between Lois Wilson (former moderator of the United Church), a local rabbi, and a graduate student from the University of Victoria. They were an example of civil conversation between adherents of the three great monotheistic faiths. As Wilson pointed out in her usual straightforward manner, to pretend there aren't differences produces religious "mush" but we have an obligation to listen with respect and to learn with openness. I wasn't aware of that co-existence of faith in Spain during that time. How interesting! Religious 'mush' is an interesting concept. My atheist friends posit that if you remove the ceremonial aspects of most major religions, they are (to their way of thinking) almost entirely alike. I begged to differ, but then again, I was TRYING to appreciate their point of view. There are basic premises such as compassion, peace-making, justice for the poor and oppressed, self-giving love which are upheld in most religions. The way we perceive God is very different. Christianity makes the audacious claim that God comes to us in Christ. Buddhism is a non-theistic religion. Islam looks to the Quran the way Christians look to Christ. We have our intersecting points and our profound and interesting differences. Those who suggest all religions are alike just aren't paying attention.